Product prices and availability are accurate as of 2019-04-18 01:23:42 EDT and are subject to change. Any price and availability information displayed on http://www.amazon.com/ at the time of purchase will apply to the purchase of this product. Get reliable, high-performance access to your critical data FileMaker Server 11 is fast, reliable, easy-to-use server software to securely manage groups of FileMaker Pro users over a network or on the web. Run at peak performance, maintain databases with ease, and get time-saving automation capabilities. 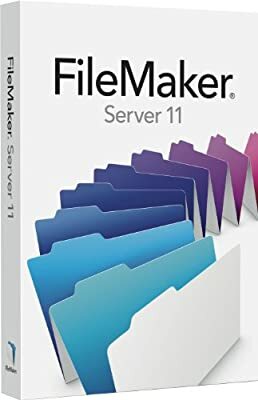 FileMaker Server 11 is fast, reliable, easy-to-use server software for groups of FileMaker Pro users that lets you securely share databases over a network, or on the web. 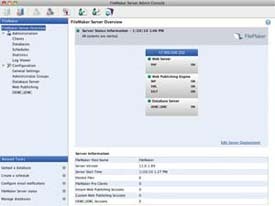 With FileMaker Server 11, you can run your databases at peak performance with helpful diagnostic tools, maintain and back up your databases with ease, and get time-saving automation capabilities. Use built-in PHP Site Assistant themes to create visually stunning websites in minutes. Click to enlarge. 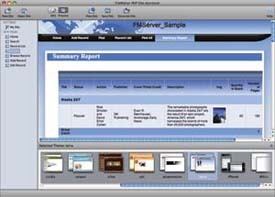 Fast, reliable, easy-to-use server software for managing your FileMaker Pro databases. Click to enlarge. 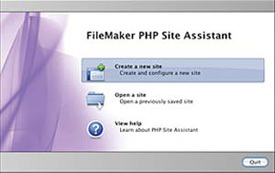 The PHP Site Assistant guides you step-by-step to produce PHP-based web pages based on your FileMaker Pro layouts--no PHP coding skills required. Basic installations take just 20 minutes or less. Manage your databases remotely and automate administrative tasks. Run FileMaker Server in a mixed Windows and Mac OS X environment. Monitor every FileMaker Pro client on the server to diagnose potential issues. Get anytime access to your data with 24/7 availability. Protect your data with scheduled live back-ups. Connect up to 250 simultaneous FileMaker Pro users. Get greater security and network performance for your shared databases. Manage user accounts and passwords efficiently through external authentication via industry standard Active Directory and Open Directory. Use SSL encryption for secure data transfer. Protect sensitive information by filtering the display of hosted database names based on user privileges. Create custom, data-driven websites using PHP. Use the PHP Site Assistant for step-by-step help in creating PHP websites. Get detailed visibility into every FileMaker Pro client on the server to help diagnose potential issues. Save an empty version of your database to help preserve the schema and architecture of your file while troubleshooting your database. Automatically save and load your server schedules when migrating to new hardware. Get the access privileges you need by selecting a specific user account to run system-level scripts. Set optional time limits for script schedules to keep your databases running more efficiently. Manage databases remotely from any computer on the network. Schedule automatic backups for data protection. Automate administrative tasks with the Admin Console. Receive email notifications of errors or completed maintenance activities. Share with larger groups of users compared to peer-to-peer sharing. Centralize your live external SQL connections. Publish data to the web using PHP or XSLT. Secure data transfers with SSL encryption. Manage user access through external authentication via Active Directory/Open Directory. FileMaker Server 11 is fast, reliable, easy-to-use server software to maintain and monitor FileMaker Pro databases with ease, and to improve scripting flexibility Get anytime access to your data with 24/7 availability. Protect your data with scheduled live back-ups. Connect up to 250 FileMaker Pro users plus get greater security and network performance. Utilize external authentication via Active Directory/Open Directory. Use SSL encryption for secure data transfer. Create custom, data-driven websites using PHP. Use the PHP Site Assistant for step-by-step help in creating PHP websites.